Earlier Unique Property Bulletin Item – 29/11/17. Auction Day – 11th December 2017. 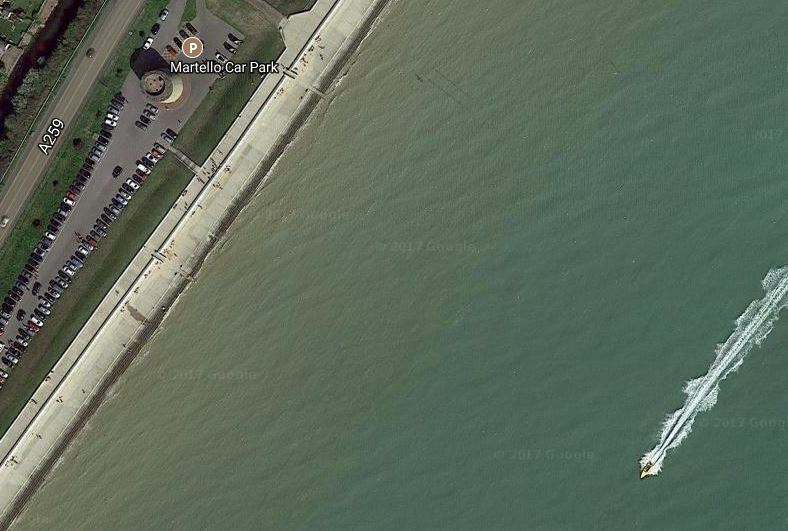 Dymchurch – Martello Tower Number 25. Guide Price (December 2017) £70,000. 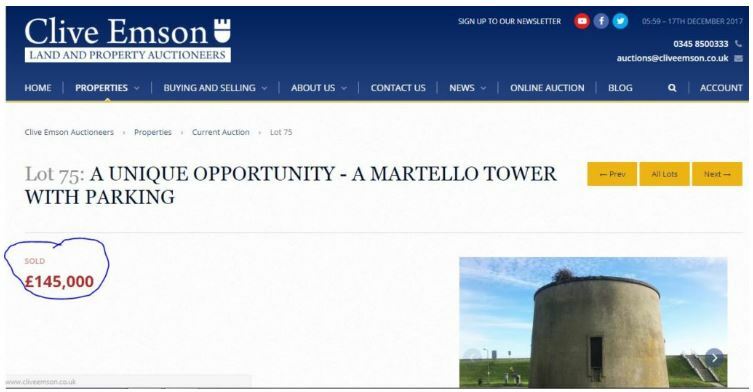 There are not many of these Martello Towers left, and those that still exist are seldom placed for sale. This one is being sold by auction on 11th December 2017. It is surrounded by a car park (not included). 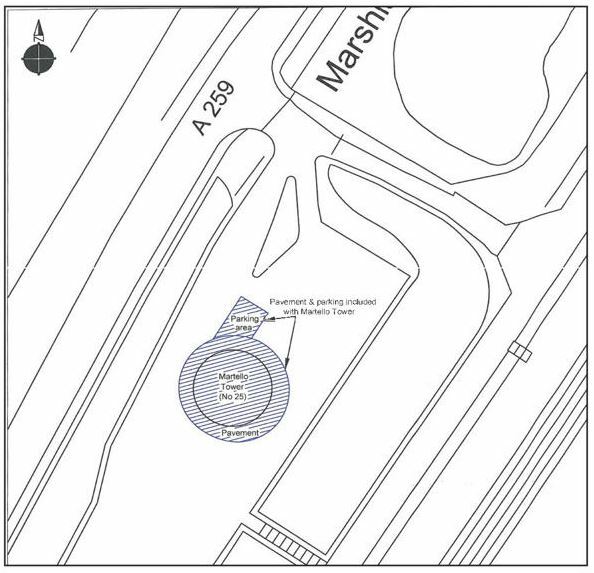 The auctioneer mentions it does come with parking. As you can see, there isn’t a lot – enough for a car. But at least you won’t have to feed the municipal parking meter a ton of your spare change! Dymchurch – Martello Tower Number 25. 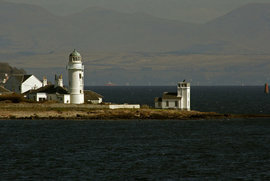 This old tower is also fairly close to the sea. So the view from the gun deck on top of this structure should be quite the thing. If you are considering this style of purchase and property adventure we would recommend you spend a short break in one to gather inspiration and also research the rules and regulations. These usually come with listed status. 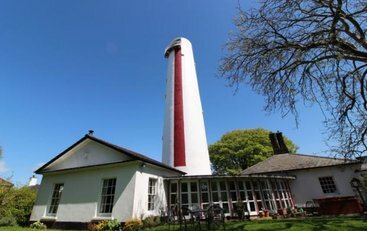 One very nice renovation is by the Landmark Trust and you can holiday at their Martello Tower: Click Here. 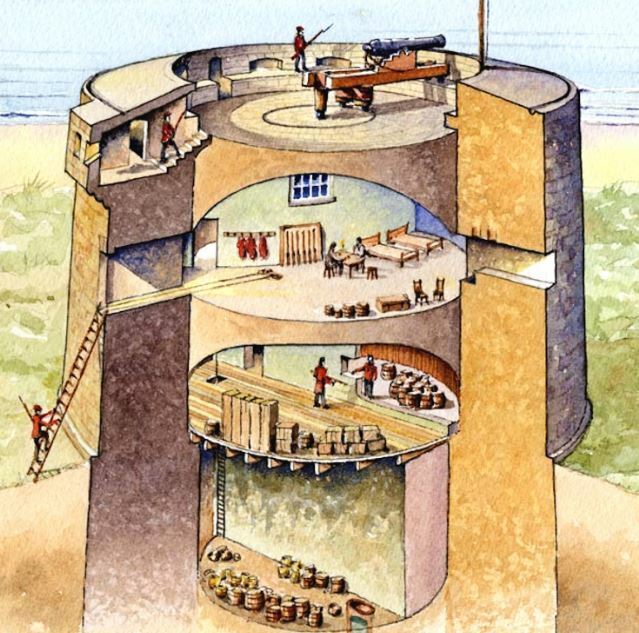 How Would You Convert Dymchurch Martello Tower? Artists impression – please do not scale. 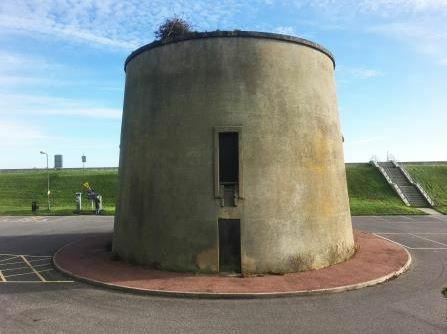 Of course, you might end up visiting the Landmark Trust’s holiday Martello Tower after bidding on Dymchurch – as the auction lead in time isn’t overly long. 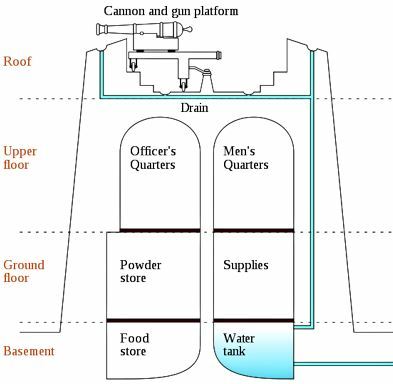 Drawing For Guidance Only: Typical Cross Section Elevation. 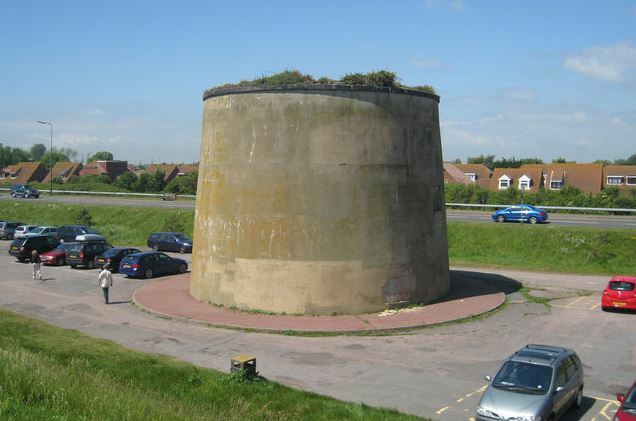 This Martello Tower was “guided” by Clive Emson Auctions at £70,000. It sold on the day for £145,000. This sort of inability to GUESS anywhere near to an accurate guide makes us very angry. Either it is incompetence, inexperience, or something else. 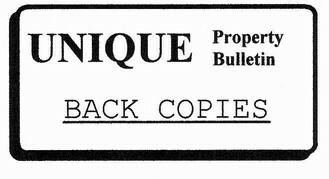 If you cannot guess a “guide” price anywhere near to the actual value of a building, PLEASE stop putting guides on your details. Either that or the Advertising Standards Authority will have a new complaint submitted. The old one can be seen: here. This would not be the first time this type of issue had a statutory warning to the property auction industry. The reason we get so angry is that many people take a day off work, sort out large amounts of money and attend these auctions on what may fairly be described as approaching a false prospectus. All in all, each year, buyers WASTE tens of thousands of pounds of their money because “professional” auctioneers haven’t a clue how to value some of their buildings. As for any auction house who takes exception to our compliant, don’t you dare write or telephone moaning that this sort of thing is the seller’s fault as it was their guide! You are the professional. It is YOUR reputation on the auction house name/brand. You are big enough and ugly enough to put your foot down and let the seller know you will not be party to this misleading practice. If any of our Unique Property Bulletin readers have been a buyer who has been encouraged to travel and bid at a property auction because of a chronically low auction “guides”, please let us know: text or telephone in confidence to us at: 0793 557 2803. We now have a national newspaper consumer affairs journalist looking into this matter and are keen to help have this inconsiderate practice stamped out. 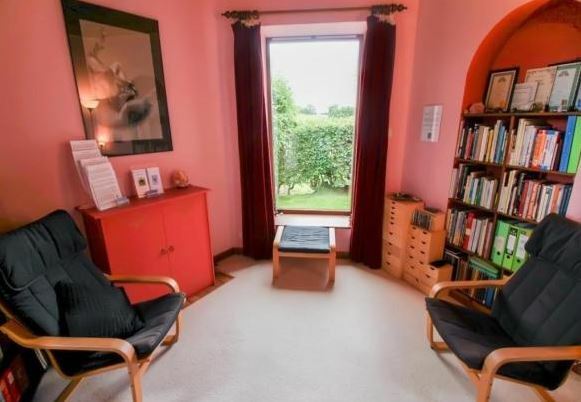 A professional firm such as Clive Emson property auctions should be able to do far better than apparently guess their “guide” at £70,000 when the actual property sells for over twice that amount at £145,000. Some less reputable auction houses suffer from chronic undervaluation at auction guides. We expect far better from a market leader such as the highly reputable Clive Emson auctioneers. This unacceptable lack of accuracy is costing innocent buyers hundreds of pounds each in wasted trips to auction houses. This problem will now be addressed. To be absolutely clear, if you find our website offline (rarely) then just change the suffix at the end of www.uniquepropertybulletin. from .org to .co.uk or vice versa, We have two completely separately hosted, near identical websites precisely for the one or two hours a year we get one or the other going offline. A fairly simple safety precaution, but it means that our readers should always be able to find Unique Property Bulletin on the internet. 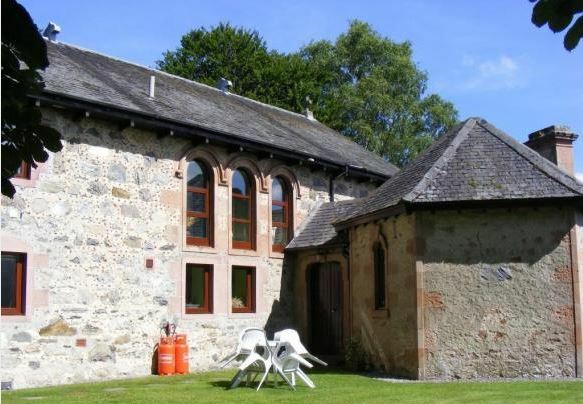 This fine example of a converted church dates back to 1836. 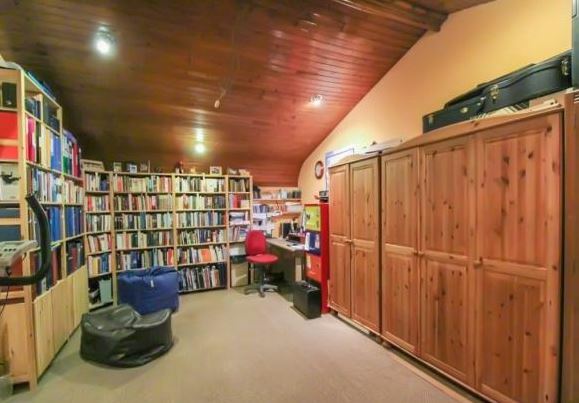 It has four bedrooms, plus a games room and study. 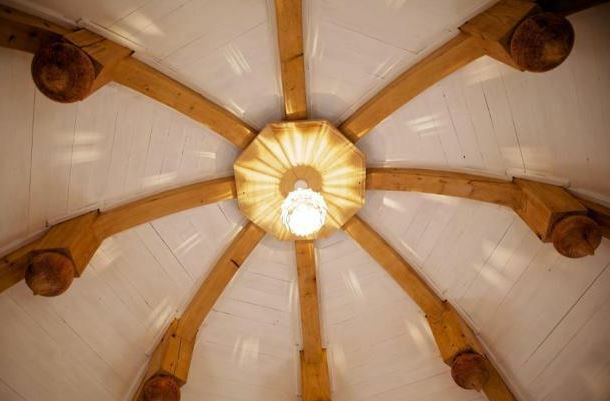 The building retains many original features and is set in approximately half an acre of garden. This has a lot of lawn area and several mature trees. 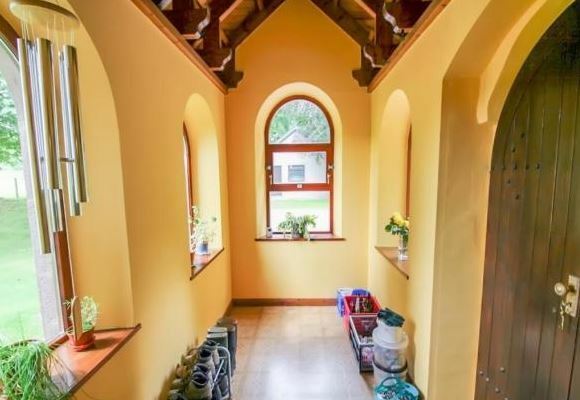 he old church also has a detached double garage. All in all a decent sized place for the money. 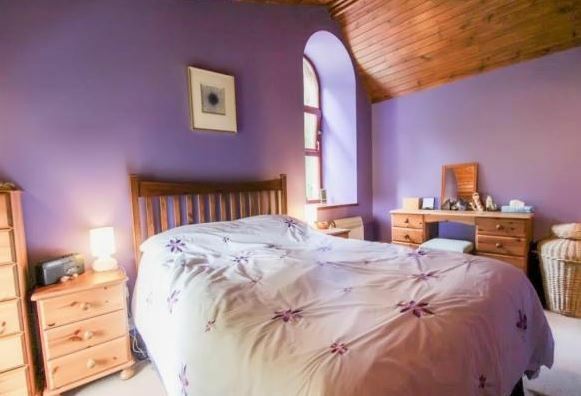 As you can see from the floorplans and some of the photographs featured above, there is quite a lot of time, love and care invested into this former church building. 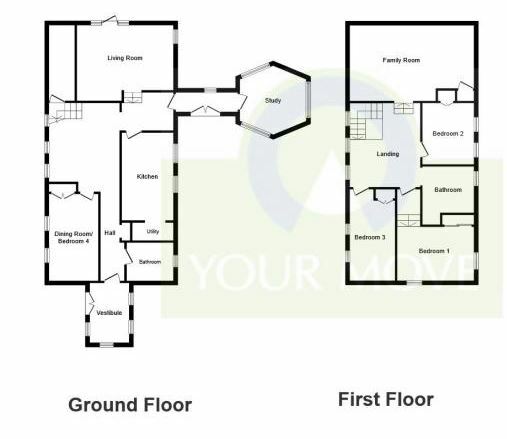 So does this style of property make you happy or sad? 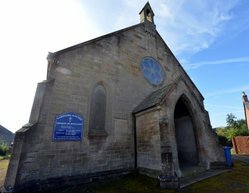 Do converted churches do it for you? 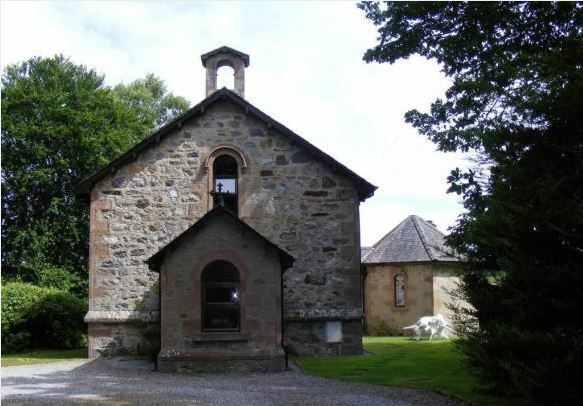 More to the point, might you be putting in an offer for this detached church? 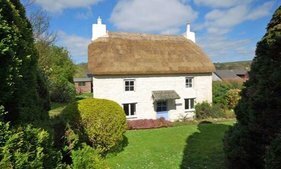 For newer readers, please note: Unique Property Bulletin is NOT an estate agency – we are a not-for-profit website that aims to help folk find interesting homes to buy. A Fair Cop? Watch This Space! We are not too sure about the guide price on this old cop shop. In April last year, one of our core unique property club members travelled several hundred miles to Eddisons Auction with a £22,500 cheque in his pocket to bid on a different lot from this group of auctioneers. Indeed, on 21st April 2016 many folk went to bid on Midgeley Water Tower. 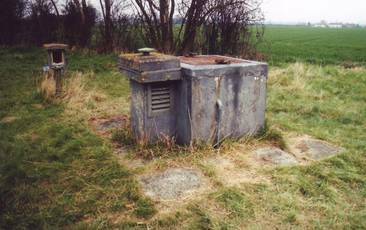 Eddisons, which now own Pugh Auctions set the guide for Midgeley Water Tower (in concert with their seller). 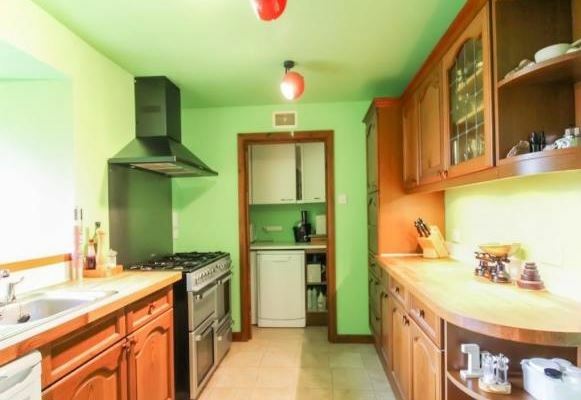 A tasty £4,000 estimate by the RICS qualified professionals at Eddisons had the effect of encouraging a lot of interest. But was the £4,000 fair or accurate guide price? Evidenced here. Our Unique Property Bulletin reader didn’t get a look in. 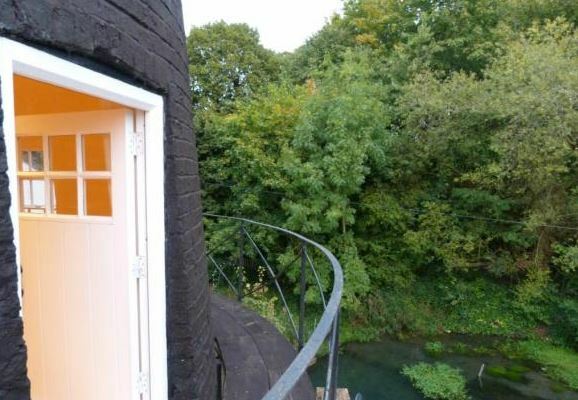 The water tower sold for £110,000 (here). 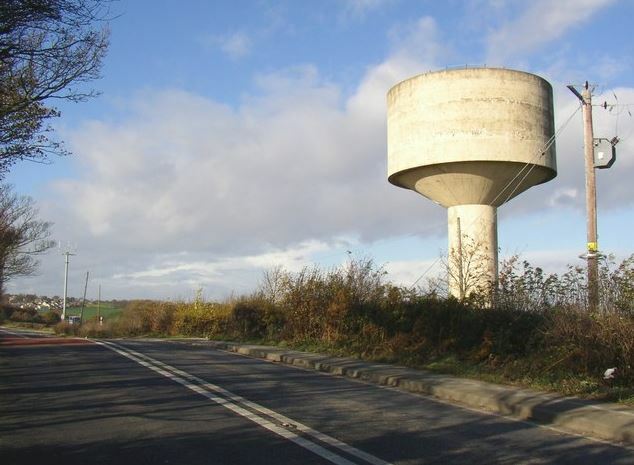 Would you travel to auction for this £4,000 Water Tower? Yesterday afternoon (3/11/17), Unique Property Bulletin chatted with Mr Paul Thomson from Pugh Auctions about guide prices and how accurate they are. Mr Thompson was very reassuring. 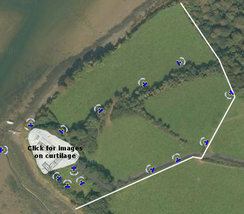 Advising that this was generally within 10% of the reserve. BUT there can be no guarantee that the guide, or reserve will an be within 10% of the final sale price at the fall of the hammer. At Unique Property Bulletin, what might be our advice to would-be buyers at ANY UK auction? First, as always we strongly recommend you attend any and all property auctions in person when buying (we dislike the remote proxy bid system). 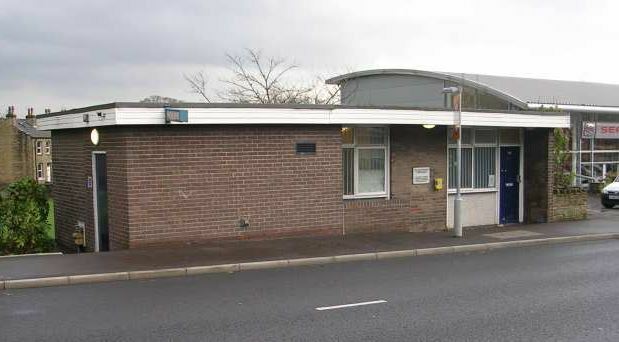 Second, be prepared that whatever you are bidding on (this former police station and many other UK-wide auction lots) may well sell for a lot more than the guide price. 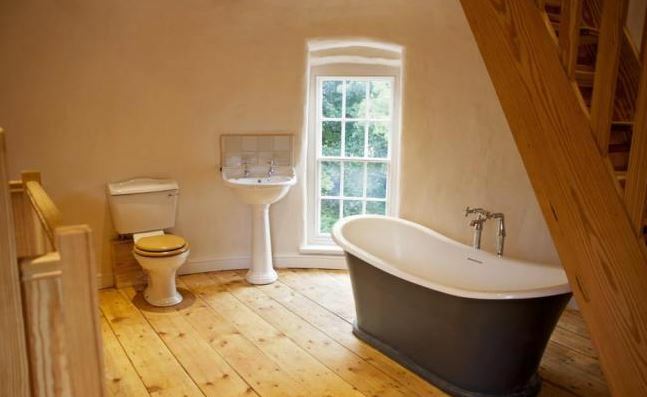 From 30 years writing Unique Property Bulletin, we reckon this former police box/station pictured above will go for £20,000+. That is double the guide. A 100% variation on that guide. The auction is on 7th December 2017. If we are wrong about the £20,000+ final price we shall donate £100 to charity. If we are right and Pughs plus other auction houses are having problems getting their “guide” and “actual sale” prices in the same ballpark, then we will need to consult our readership on whether the nationwide system of guide prices needs to be reviewed? 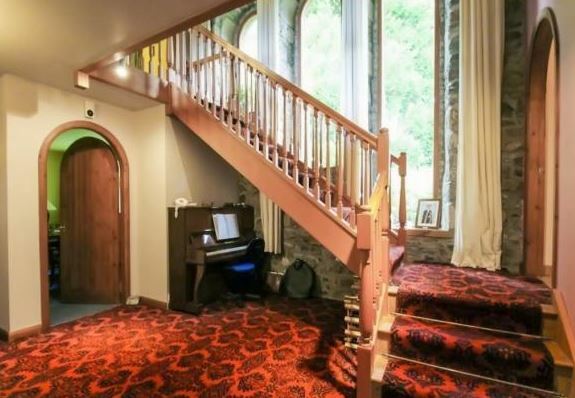 Our Unique Property Bulletin reading friend’s Midgeley Tower style disappointment is repeated week in, week out by many of our tens of thousands of readers – and hundreds of thousands of UK auction-goers. We believe there may be a need for an industry-wide review. We were comforted greatly by the professionalism at Pugh Auctions, but not all UK property sellers have such high standards. So please watch this space. Either someone will buy an old police station at a pretty amazing price of around £10,000; or a national conversation will have to be begun as to whether the Auction House UK Ltd., slap on the wrist by the Advertising Standards Authority (here) to do with guide prices and reserves, should be extended to professional standards on what the actual hammer sale price percentage variation is to the published guide. 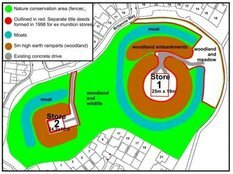 We believe the correct arena if this requires attention is within the House of Commons parliamentary select committee system. Witnesses may need to be brought in to answer probing questions and help frame new laws and/or statutory instruments. Plus some strong forensic studying as to whether this guide-to-actual sale price is a widespread issue of concern. Our mailbag would suggest it is! As Paul Thompson from Pugh Auctions reassured us – the most reputable auction houses strive to work by the highest standards. 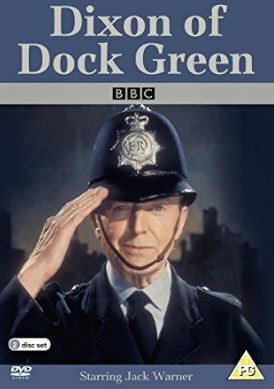 When our UPB friend spent/wasted his £200 due diligence/travelling money, and a day off of his work as a firefighter to go to Eddisons auction based on their very low guide of £4,000 – with a £22,500 cheque in his pocket. Their lot sold for £110,000 and that is questionable to say the least. Literally: we would like to ask questions on whether this is a common problem? If it repeats with the ancillary benefit to auction houses of baiting more people to attend their rooms than would otherwise be the case, then a remedy is required. Our firefighter friend’s words to us for featuring that Eddison auction lot were choice. Unprintable in fact! Our guilt? To rely on Eddisons competence in guessing a “guide” price that is in the same universe, let alone ballpark as the “actual sale price”. 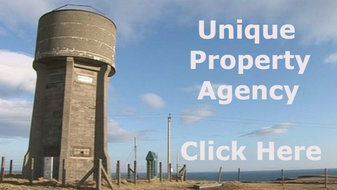 We can but estimate how many people go to auctions and have a similar frustrating time when they don’t get to put their paw in the air to bid, and stand no fair chance to buy a lot at FIVE times the guide price when, as with Midgley Water Tower, it sold for TWENTY SEVEN times the published auctioneer’se guide price! We would note that this is not a reflection on Pughs. 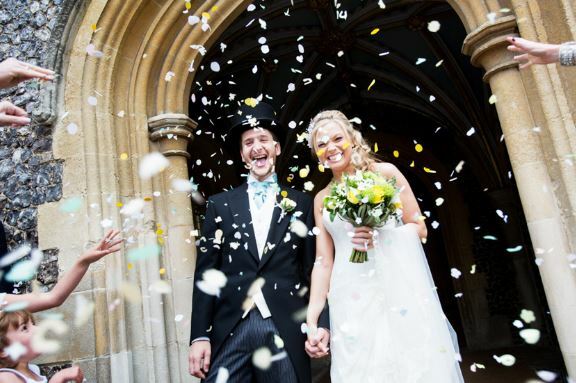 They are in our TOP THREE favourite UK auction houses. Anyone looking at the thousands of pounds worth of free publicity we have given to Pugh Auctions within our publications over the years will realise we wish them well and have supported them with much good praise. The proof…. The old bill on this police box seems a fair cop! 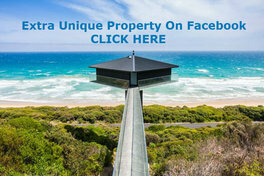 As to the wider auction industry concerns on the radar of our Unique Property Bulletin group? If you have had an adverse experience with any UK auction event where the hammer sale price has varied wildly against the published guide price, please let us know by phoning or texting: 0793 557 2803. Thank you. Definitely an interesting building in which to live. Apart from the unusual nature of this future home you may chose, something else jumped off of the page when the schedule landed on our desk. 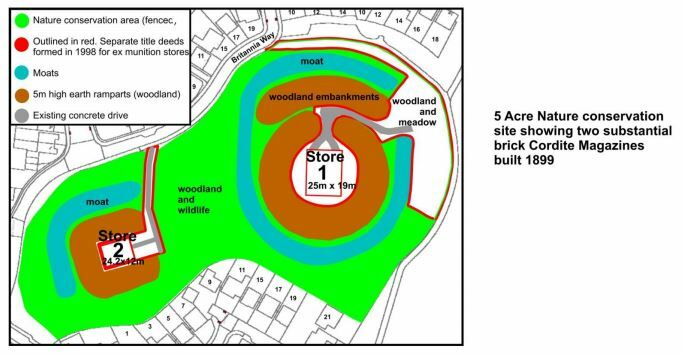 The Land Registry details from April 2013: this property appeared to sell for a bargain £84,000. 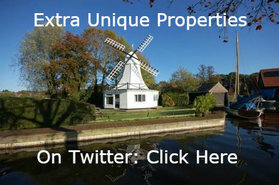 Now offers in the region of £425,000 are sought. Official Land Registry Data. Useful At Current Negotiations. The reason for such a massive price jump could be the cost of extensive refurbishments during 2013-2017. It might be that there was a separate mill house elsewhere in the area, and the Land Registry excerpt above is for a different building to Legbourne Windmill. Also, please be careful when broaching the subject of previous prices with a current seller. We knew one grumpy old goat who slammed the door on a buyer who had the temerity to ask if an offer slightly lower might be acceptable – given the officially recorded Land Registry price she originally paid was now 2.5 times what she bought it for. 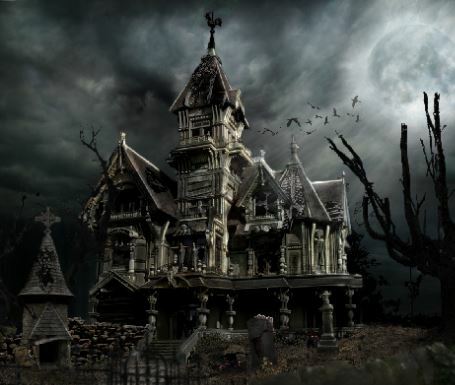 The buyers lost a house they liked and the seller paid dearly for being a misery. Most fair and decent people would take from this, that the sellers are reasonable and open minded to offers. 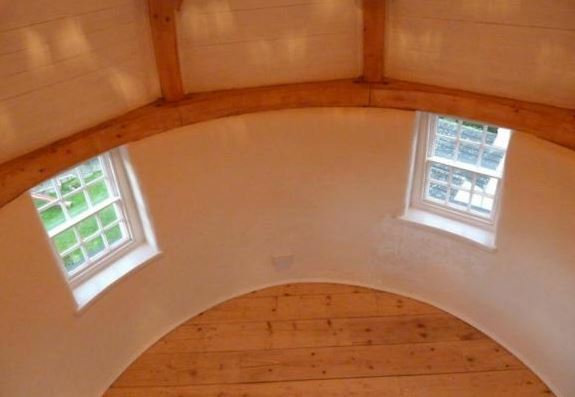 Legbourne Mill, Mill Lane – Round Room or Sad Face! The mill was built in 1847 and since it stopped milling flour, it has gone through a number of bad renovations that the current owner has remedied to a high degree. 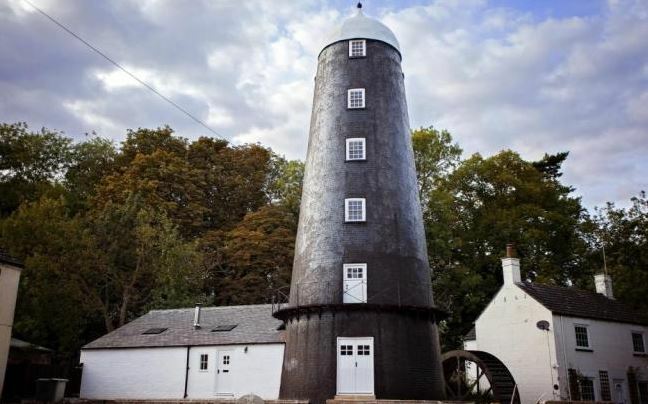 In its day the mill would have been the glory of the village being one of very few combination wind and watermills in the whole country. 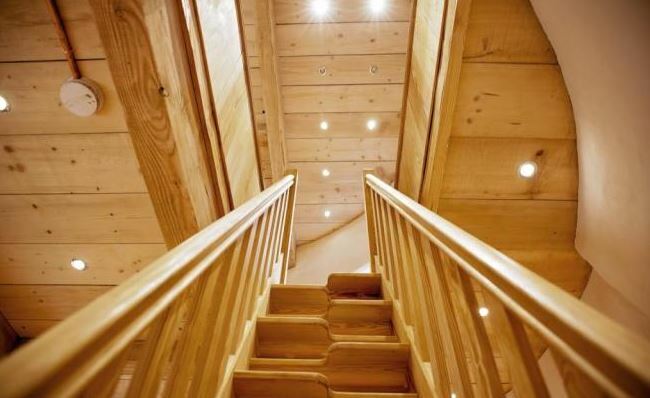 It now boasts a luxury, but very traditional interior that is extremely pleasing to the eye. 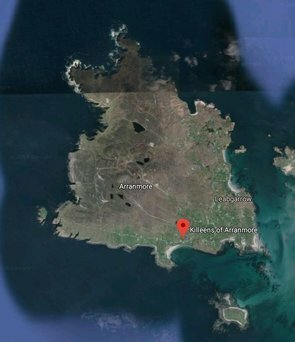 This property would make a lovely home, or a very lucrative Holiday let. 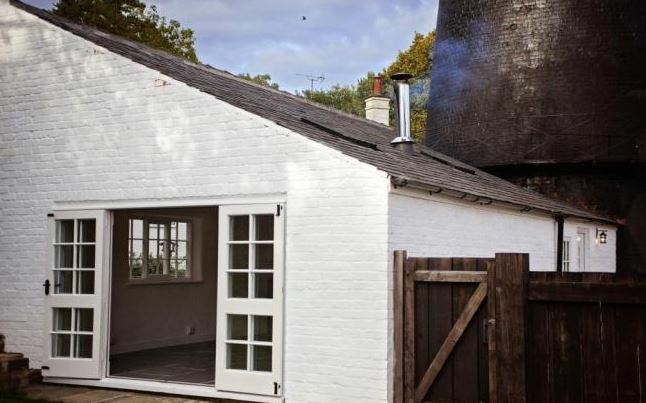 The extension to the mill tower has been opened up to great effect, creating a wonderful large open space and living area. 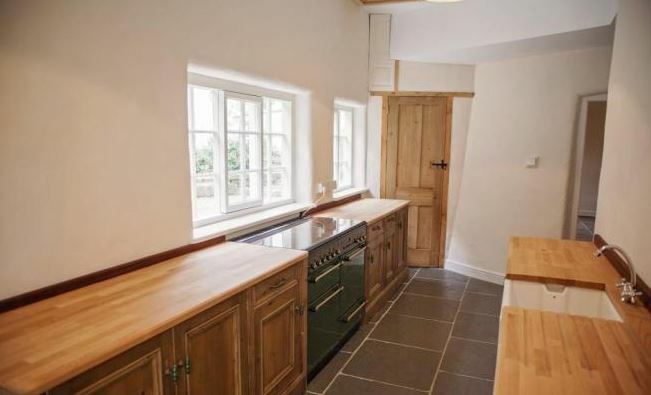 The extension features a wide galley kitchen in old pine and a spacious living area with log Burner. There are some large double patio doors that lead out to a private fenced garden, with a York stone patio to the rear of the building looking over the river.